Following its appearance at the Severn Valley Railway for the line’s diesel gala, D9009 ‘Alycidon’ is due to head north to Bury tomorrow, in readiness for its use alongside D9016 ‘Gordon Highlander’ on a Driver Experience Day on Friday 11 October. D9009 will be ‘dead in tow’ on this move, which will be hauled by the NRM’s 55002 ‘The Kings Own Yorkshire Light Infantry’ – 55002 will continue with D6700 back to York after dropping off D9009 (and 37109) at the ELR. Thanks to everyone who supported the Severn Valley Railway gala, the picture below shows D9009 in action on the 12.59 Kidderminster-Bridgnorth on October 5th after emerging from Bewdley Tunnel. Thanks go to David Griffiths for supplying the photo. FRIDAY: 12.37 Kidderminster-Bewdley, 13.35 Bewdley-Kidderminster, 14.35 Kiddermister-Bridgnorth, 16.54 Bridgnorth-Kidderminster. 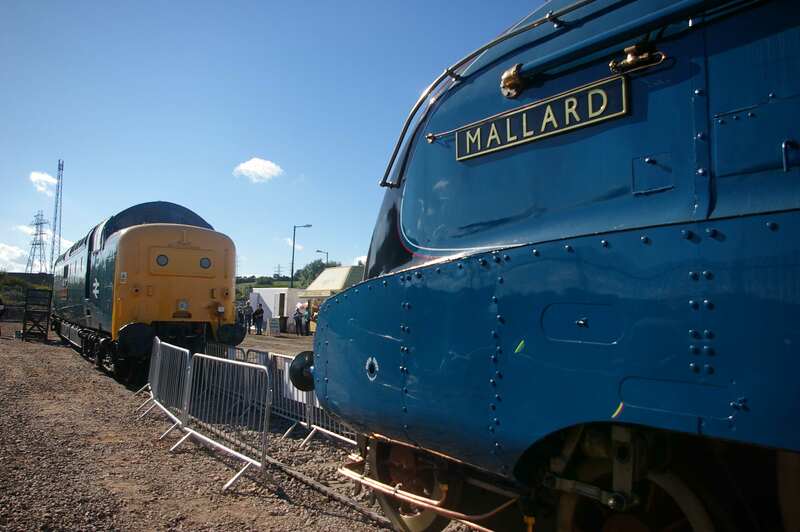 This weekend sees the “Barrow Hill Live” event taking place, and there will be plenty to see for Deltic followers. 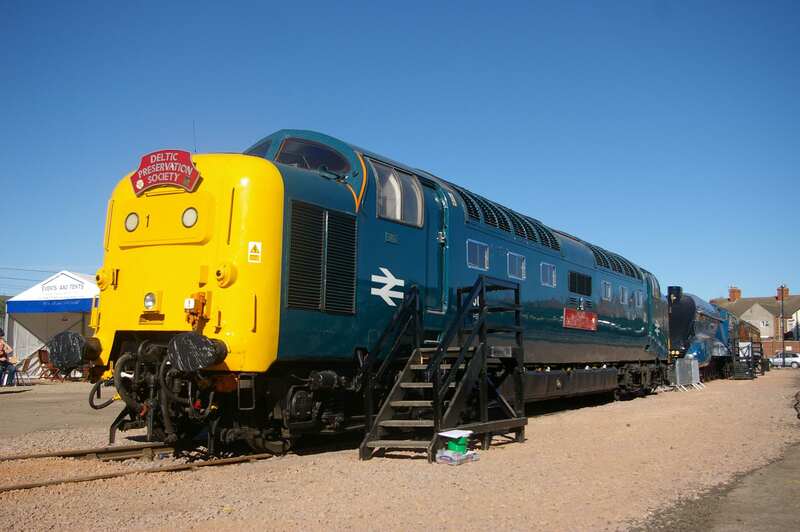 A guest Deltic, in the form of the NRM’s 55002 ‘The Kings Own Yorkshire Light Infantry’, will be present, as well as our own D9015 ‘Tulyar’ undergoing restoration and 55019 ‘Royal Highland Fusilier’. The DPS depot will house a modern traction layout, ‘Deepcar’, and there will be a 5″ gauge model of the prototype DELTIC on display. In addition, if you are in the area on the evening of Friday September 27th, why not join the Deltic enthusiasts who are having an informal get-together at the Corner Pin pub in Doncaster from around 6pm onwards. Following its appearance at the North Yorkshire Moors Railway diesel gala last weekend, D9009 ‘ALYCIDON’ took the two visiting Diesel Hydraulics, D821 ‘GREYHOUND’ and D1062 ‘WESTERN COURIER’, back to the Severn Valley Railway today. The picture below shows the convoy at Shipton, north of York. D9009 will remain at the Severn Valley for the line’s Diesel Gala, which is on October 3-5. The loco will be operating on two of the days (October 4 and 5), and details of its booked workings will follow shortly. In addition, as previously mentioned, D9009 ‘ALYCIDON’ is due to haul D821 and D1062 back to Kidderminster from the NYMR on the same day. 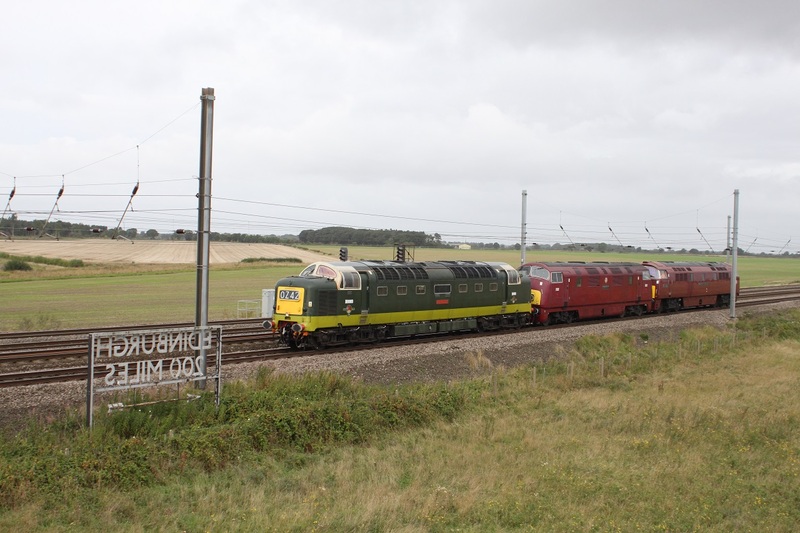 Wednesday 18th September should also see the NRM’s 55002 in action on a York-Mid Norfolk Railway move – a busy period for Deltics! The DPS members day, this year held as part of the NYMR Diesel Gala, saw D9009 ‘ALYCIDON’ break new ground with a run to Whitby, the fourth Deltic to appear at the North Yorkshire resort. Unfortunately, the run to Battersby had to be curtailed just after Egton owing to a bridge bash by a road vehicle which also caused services between Middlesbrough and Whitby to be cancelled. The train had to return to Whitby, from where D9009 was able to take up the remainder of its booked diagram. 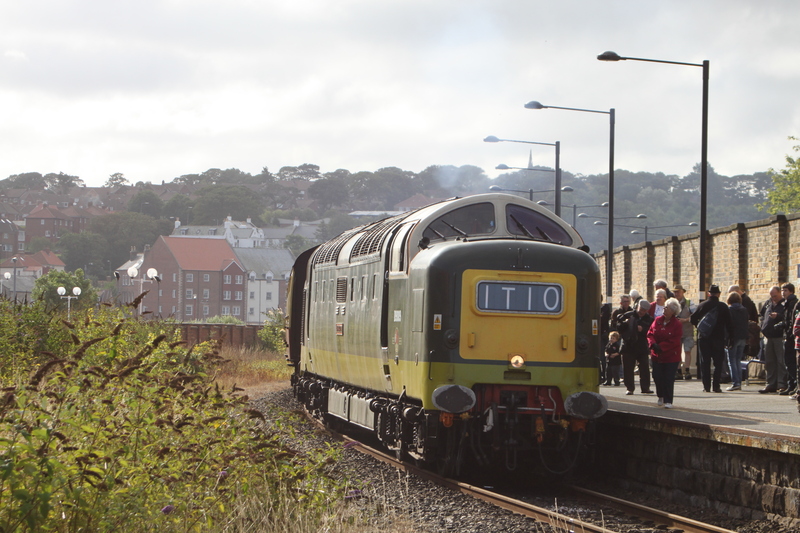 The photo below shows D9009 shortly after arrival at Whitby after hauling the 09.45 ex Grosmont. 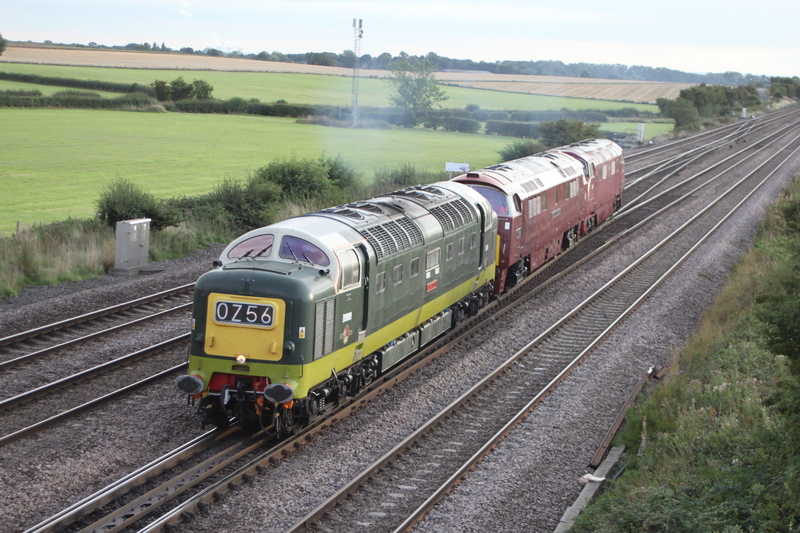 The two pictures below, supplied by Stuart Page, show the two locos at the Grantham event. D9009 ‘ALYCIDON’ hauled the first leg of the NYMR convoy move today, first running light engine from the East Lancashire Railway to the Severn Valley Railway. At Kidderminster, it collected D821 ‘GREYHOUND’ and D1062 ‘WESTERN COURIER’ for the journey north to York, running early for much of the trip. The photo below shows the convoy at Colton South Junction.